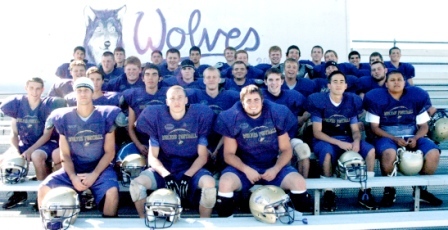 (September 22, 2006: Sequim, WA 98382) In Friday's league game, the host Sequim Wolves football team scored a big 44-22 win over the Klahowya Eagles. The Wolves (2-2) will now prepare for their game against North Mason (Belfair, WA). The Bulldogs enter the 2A Olympic game with a 3-1 record. In their last game, North Mason trounced Port Townsend (Port Townsend, WA), 51-6, in a league game. Next up, the Eagles meet the Port Townsend Redskins (Port Townsend, WA) in a 2A Olympic game, on Friday, September 29. Klahowya will attempt to improve on its 0-4 season record. The Redskins enter the game with a 1-2 record after their 51-6 league loss to North Mason (Belfair, WA). Sequim - Nic Thacker 1 yd run. Lance White 2 pt run good. Sequim - Chris Riggs - 14 yd run. Keller Batson kick good. Sequim - Lance White - 5 yd run. Lance White 2 pt run good. Sequim - Lance White - 3 yd run. Batson kick good. Klahowya - Solaita - 10 yd run. Run failed. Sequim - James Henning - 6 yd run. Batson kick good. Sequim - Chris Riggs - 6 yd run. Batson kick. Klahowya - Solaita - 7 yd run. 2 pt run good. (September 15, 2006: Sequim, WA 98382) Peninsula Seahawks (Gig Harbor, WA) fans were pleased Friday as they witnessed their football team trounce the host Sequim Wolves (Sequim, WA), 43-22 in a league game. The Wolves now own a 1-2 record. They play next when they host Klahowya for a 2A Olympic game on Friday, September 22. Sequim will meet a Eagles team coming off a 41-8 league loss to Olympic (Bremerton, WA). The Eagles record now stands at 0-3. Peninsula - #44 17 yd. run. Kick good. 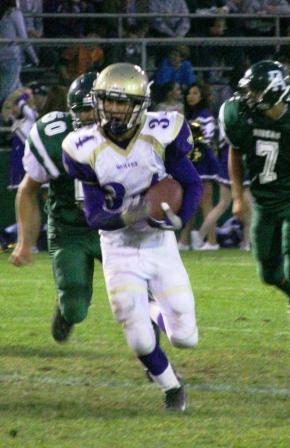 Sequim - Eric Zangara 42 yard run. Keller Batson kick. Peninsula - 71 yard kickoff return. Kick good. Sequim - Zangara 42 yard run. Batson kick. Peninsula - #3 3 yard pass from #15. 2 pt pass good. Peninsula - #3 15 yard pass from #15. 2 pt pass good. Peninsula - #2 30 yd run. Kick good. Sequim - Wyatt Short 1 yd run. Kick failed. Peninsula - #44 17 yd run. Kick failed. (September 8, 2006: Port Angeles, WA 98362) In Friday's league game, the host Port Angeles Roughriders football team scored a close 34-31 win over the Sequim Wolves. The Roughriders now own a 1-1 record. They play next when they travel to Seattle Prep for a non-league game on Saturday, September 16. Next up, the Wolves meet the Peninsula Seahawks (Gig Harbor, WA) in a 2A/3A Olympic game, on Friday, September 15. 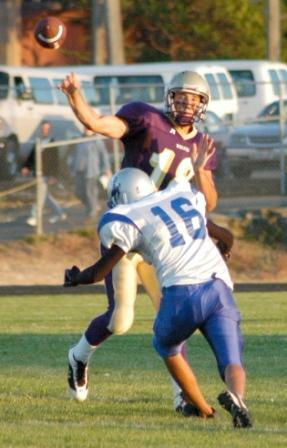 Sequim will attempt to improve on its 1-1 season record. The Seahawks enter the game with a 1-1 record after their 14-3 non-league win over Gig Harbor (Gig Harbor, WA). PA - #5 6 yd pass from Stefan Walker. Kick good. PA - Lane 17 yd pass from Walker. Kick failed. Seq - Austin 52 yd pass from Short. 2-pt conversion failed. PA - Madison 6 yd pass from Walker. Kick good. PA - DeFrang 18 yd interception return. Kick good. Seq - Zangara 11 yd pass from Short. White kick. Seq - Zangara 39 yd run. pass failed. Seq - Zangara 15 yd run. Kick failed. Seq - Zangara 5 yd run. Kick failed. PA - Lane 47 yd pass from Walker. Kick good. (September 1, 2006: Sequim, WA 98382) Sequim Wolves (Sequim, WA) fans were pleased Friday as they witnessed their football team trounce the visiting Chimacum Cowboys (Chimacum, WA), 41-2 in a non-league game. The Wolves now own a 1-0 record. They play next when they travel to Port Angeles for a 2A/3A Olympic game on Friday, September 8. Sequim will meet a Roughriders team coming off a 47-28 non-league loss to Auburn Riverside (Auburn, WA). The Roughriders record now stands at 0-1. Next up, the Cowboys meet the Klahowya Eagles (Silverdale, WA) in a non-league game, on Thursday, September 7. Chimacum will attempt to improve on its 0-1 season record. The Eagles enter the game with a 0-1 record after their 21-14 league loss to Bremerton (Bremerton, WA).